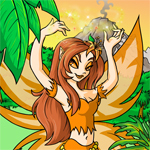 There are six types of faeries in Neopia: air, earth, fire, water, light and dark. And they don’t live only in the Faerieland, but around the entire Neopia, doing items requests, spreading their magic, blessing our neopets and making Neopia a better place to live. Earth faeries, for example, protect the forests where they live. Water faeries have curative and defensive powers to protect our neopets from evil. The light and air faeries live on the upper levels of Neopia, caring for and blessing our neopets with powers of restoration and the ability to fly. The fire and dark faeries are rather mischievous and love to play tricks on the helpless neopets, but don’t be fooled, they are pure in heart. And If you were a Neopian Faerie? Which one you would be? If you don't know, run now to the Faerie City and take your Personality Quiz. It’s easy and quick. The quiz has only seven questions that are very simple to be responded. Take your quiz now, because this week we have some predictions to each one of those faeries personalities. Fire Faeries – "You are very spirited and prefer being nice and warm." The aspect of the week emphasizes your dreamy nature. It's a good week to change and transform. Maybe the lab scientist is in a good mood for you. As a good time for communication, take advantage of this change and use creativity to show your talents, spread yourself and make contacts. How about enter in one of the site's contest? Customisation Spotlight, Pet Spotlight, Beauty Contest… You and your pet will have a lot of fun! This is also a great moment to be with your family, and by family, I mean your pets, Petpets and Petpetpets. Take care of your loved ones. Air Faeries – "You enjoy fresh air and have a positive (if somewhat relaxed) attitude about life." Everything leads you to be wiser in making decisions and in this phase you will be more positive. This is a busy week, with an intense social life, good moments and meetings. How about send a Neomail to that old Neofriend? Or joining a guild and make new Neofriends? Don’t forget to pay attention on what you’re eating. Shop some Neopian Health Food and you will easily enjoy this frenetic week. You can also go through some mishaps, an unforeseen, something that changes without you having wanted, but the results are so positive that you will not suffer too much because of it. Item of the week: Honey Shampoo. Light Faeries – "You are usually cheerful and full of energy, and love going outside on sunny days." It's a good week to start or intensify some project. How about studying and learning something new, like, how to get more trophies for your profile? Or how to draw your neopets? Or how to feed Kadoaties on the Kadoatery? It's also important that you listen yourself more and pay attention to the signs of life. A treasure waits for you in the Faerie Caverns, just follow your heart and your adventure spirit. Team work is also favored this week. It is a time of more flexibility and communication. Item of the week: Princess Vyssa. Dark Faeries – "You probably enjoy playing tricks on others and are most happy at night." At that moment, the most important thing for you must be economic stability. It's a good time to invest more in yourself and to organize better financially. Don't forget to check your stocks and go to The National Neopian Bank to collect your daily interest. This week you may experience new ideas, inner strength, courage, and persistence. Trust yourself and you will get what you want. 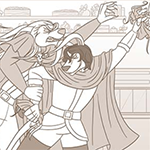 Be ready for the battle, training your pets status, getting some faerie blessings and abilities. But Try to get out, play some games and have some fun, life is not just work. Avatar of the week: Shoyru - Tough! Water Faeries – "You have a calm personality, and love to swim and splash water around." Avoid annoyances, quarrels and intrigues, leave your astral serene and try to be more relaxed in some situations. It's a special week for a trip, even if it's quick, over the weekend. Kiko Lake and Mystery Island offer a variety of places to relax or have fun. I'm sure your pets will love a Tiki Tour. You can also call a Neofriend to travel with you. It's worth sitting and talking, whether to chat and relax, or to tell your problems and ask for advice. Take advantage also to communicate and share ideas, teach and learn with each other. Be more objective. Item of the week: Sunset On Mystery Island. Earth Faeries – "You enjoy working with your hands and watching things grow." It's a good week to make a change of habit and take better care of your health. If any disease appears, the Neopian Hospital crew can help you find the cure. The changes in the look are also very welcome. Buying a new outfit at Unis Clothing Shop will make you feel pretty and good. Rely on your personal experiences and your knowledge to get rid of any problems that may arise. Item of the Week: Magic Wand. All these predictions were assured by the Wise Old Gnorbu and the Mystery Island Mystic. And more than wish you a good week, we want you to know it’s always the day of starting again, of beginnings from the inside and the outside. Catch fire on the transparency of your essence, bind the objectives to the concretizations and live the purpose of life.